A unique formula that provides the skin with broad spectrum sun protection against harmful UVA & UVB rays. Enriched with Saxifraga Extract, Morbus Bombycis Extract, Ceramide III & Vitamin B3, this efficacious formulation works effectively to, maintain skin elasticity & firmness, hydrate the skin while fading dark spots & reducing skin pigmentation for an even skin tone. Explore the entire range of Face Sunscreen available on Nykaa. 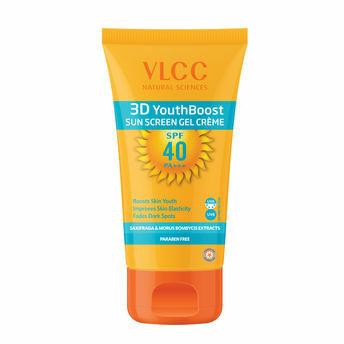 Shop more VLCC products here.You can browse through the complete world of VLCC Face Sunscreen .Alternatively, you can also find many more products from the VLCC 3D Youth Boost SPF40 Sun Screen Gel Crème range.